Christmas Party. Christmas party ideas. Company Xmas party ides. Paintball party. It’s never to early to plan your Paintball Christmas party! Why not do something different to do this year. 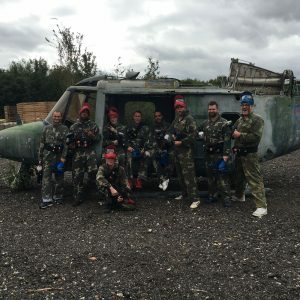 Why not have your Christmas party at one of our outdoor paintballing centres. We have locations across Kent, Essex and Hertfordshire as well as Dorking in Surrey. Our sites are all woodland theme based and we provide all the essential equipment you need to get your day going. Googles, overalls, hoods, ammo belts and your paintball guns are all included. Time slots are available from 9am to 3.30pm with the paintball generally taking around 3-4 hours. You can even order in pizza for lunch and stay the full day. We can organise Christmas parties right up to New Year and cater for groups of all sizes from 10-100 players. The adult game is played at all of our sites, so there’s sure to be one close to you. Weekends and midweek* games are available with packages from £25pp to suit every company pocket. Play paintball by day, then head to the pub afterwards to party the night away. You can see more information on the adult game here. We also offer a low impact game for smaller childrens. This is great for football teams, cubs and other groups and organisations. Minimum numbers are 10 and prices start from £25pp. You can see more information on our childrens paintball games here. or give us a call on 0333 577 6336.